Fr. Gregory was born on October 6, 1968 in Columbia, MO to Dr. B. Patrick Joyce and Katherine Joyce (Grigorieff). He is the first of two children (his sister, Anna, was a parishioner of St. Vladimir’s during her school years at the University of Michigan). Fr. Gregory’s family moved to Houghton, MI in the early 1970s. His father is an Emeritus Professor of Economics at Michigan Technological University there, while his mother is a retired X-Ray Technician. Fr. Gregory completed his elementary and secondary education in the Houghton-Portage Township school system, occupying himself more with sports than with academic pursuits. Despite this, following his graduation from Houghton High School he was accepted at the University of Michigan, where he graduated with a BA in Education in 1992. On August 8th of that year he married Beth Balma (of Hancock, MI). The new couple spent a year in Ann Arbor as Fr. Gregory studied in the intensive Russian language program of the University of Michigan Residential College. In 1993 he was accepted at Holy Trinity Seminary in Jordanville, NY. In 1994 he was ordained a Deacon by then Archbishop Laurus (the later First Hierarch of the Russian Orthodox Church Outside of Russia). On St. George’s Day (April 23/May 6) of 1995 he was ordained a priest, again by Archbishop Laurus. Fr. 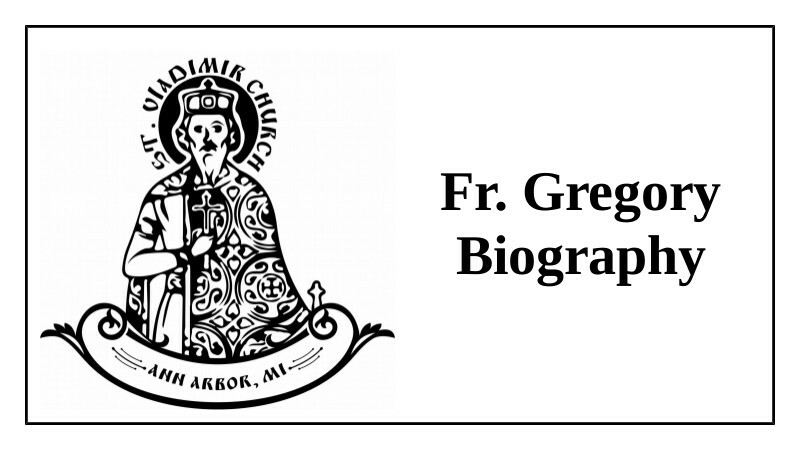 Gregory served at Holy Trinity Monastery on the clerical staff and taught English and English as a Second Language at Holy Trinity Seminary during the academic year 1995-96. He received his Pastoral Theological Certificate from Holy Trinity Monastery in 1996. Later that same year Fr. Gregory was appointed Rector of St. Vladimir’s Church by Archbishop Alypy. In 2001 Fr. Gregory received his MA in Education from the University of Michigan. In 2008 Fr. Gregory was accepted into the Doctorate of Ministry program at Pittsburgh Theological Seminary and in 2009 appointed Assistant Dean of the Pastoral School of the Diocese of Chicago & Mid-America. In 2013 Fr. Gregory completed his Doctoral Degree and was appointed Associate Dean of the Pastoral School. In 2014 Fr. Gregory was appointed Dean of the Pastoral School by the Synod of Bishops of the Russian Orthodox Church Outside of Russia. Fr. Gregory and Matushka Elizabeth make their home in Saline, MI with their three children: Maria, Michael, and Natalia. In addition to being the Rector of St. Vladimir’s and Dean of the Diocesan Seminary, Fr. Gregory is the Secretary of the Diocese of Chicago & Mid-America, and the Dean of the Michigan parishes of the Diocese of Chicago and Mid-America.